Would you rather be around greedy children or generous ones? What images come to mind when you think about greedy kids? How about generous kids? Generous people generate positive energy. Greedy people trigger feelings of there not being enough for everyone. 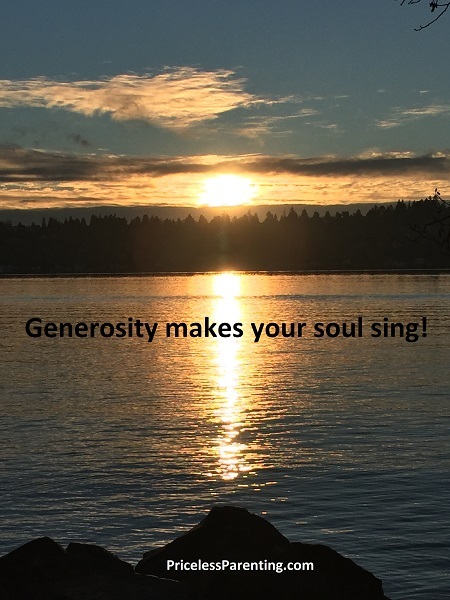 Generosity requires seeing what others need then freely giving without expecting anything in return. Does your family hold generosity as one of its top moral values? Throughout the world people give gifts to each other as an expression of what's in their hearts. In her book Living in Gratitude: A Journey That Will Change Your Life, Angeles Arrien discusses generosity. "Generosity of heart is extended cross-culturally through the practice of giving gifts. Every culture of the world gives gifts as offerings of respect, love, good will, and gratitude. There are no exceptions. December is our month of gift-giving, especially to those we love, to those for whom we feel immense gratitude, and to those who are in need or are suffering. Notice the difference in gift-giving when it is motivated by love, generosity, gratitude, and respect rather than by a sense of obligation to participate in a meaningless ritual." She highlights the huge difference between giving a gift out of a feeling of obligation rather than a feeling of love and generosity. You can feel the difference and so can your kids. When you receive a gift that someone has made or picked out especially for you, you feel their love within it. Children are particularly good at putting their love into gifts and cards. I treasure the homemade cards and crafts my kids have given me through the years. It was often a gift they had made at school – a rock with their picture glued on it, a painted tile, a handprint with a special poem or a decorated plastic placemat. They were so excited to present these gifts to us. They waited in anticipation as we opened their special gift. It was something they had made with love which made it so meaningful. When your kids create a gift or buy a gift for someone they love, it builds their generosity. Arrien goes on in her book to define the concept of royal generosity explaining "The mystical heart within each of us is motivated by 'royal generosity' - giving without expecting anything in return." Perhaps it's royal generosity that produces the greatest feelings of joy in giving. How might your family practice royal generosity? Start by brainstorming ideas with your children about how you might give to someone else who isn’t expecting it. Will you do this anonymously or will the person know it’s you? What will you do? If you come up with more ideas than you can do right away, think about how to spread this royal generosity throughout the year. Your acts of kindness will certainly be appreciated at any time of year! Is it possible to be too generous? One indication that an act is too generous is that either the giver or the recipient is negatively impacted. When my daughter was in first grade she learned about the plight of the panda bears. Being extremely concerned that they may become extinct, she gathered up all her money and asked me to send it to save the pandas. While I appreciated her spirit of wanting to help the pandas, giving away all her money would leave her penniless while not solving the pandas' problems. So I helped her donate some to an organization dedicated to helping the pandas and save the rest for the future. In another situation, one family spoke about their extreme discomfort with how much their parents bestowed upon both them and their children at the holidays. Hundreds of gifts were under the tree and overflowing into the next room. Opening presents took many hours and hauling all these presents back home took multiple trips. Instead of the primary feeling being gratitude, the primary feeling was being overwhelmed. It was just too much. When these adult children tried to talk to their parents about scaling back, the parents insisted this is the way they choose to express their love. There is no magic formula for finding the right balance in being generous. You have to look into your own heart to find the answer. How can you encourage your kids to be generous? Your kids come into the world with nothing and will leave with nothing. Everything in between is a gift. When your kids share their gifts, they benefit both others and themselves with their generosity.